The Napo River watershed, the target landscape selected for the implementation of COMDEKS activities in Ecuador, is located in the ecologically rich heart of the north-central Amazon. The vast array of plants, animals and microorganisms that have evolved together, creating an irreplaceable and thriving ecosystem, makes diversity the mainstay of life in the Amazon. The local communities have also evolved within that unique ecosystem, developing a culture rooted in the understanding, appreciation and respect of the land. However, the landscape and the traditional production activities engaged in by the rural communities is currently under pressure from social and environmental consequences of large scale extraction projects in the region, contributing to an increasing loss of biodiversity. The goal of COMDEKS activities in the area is to consolidate, replicate, and scale up the work initiated by indigenous and rural community organizations to protect the biodiversity and culture of the areas surrounding the Napo River. The landscape approach supported by COMDEKS in Ecuador builds upon the concept of ”Biocorridors for Good Living” (Buen Vivir or Sumak Kawsay), a concept adapted from the 2008 Constitution of Ecuador and the National Plan for Good Living and implemented by the Ecuador GEF Small Grants Programme (SGP), with the aim to support local initiatives focused on promoting biodiversity conservation throughout Ecuador’s various ecosystems. Biocorridors for good living are described as expanses of land where ecological connectivity is reestablished connecting fragmented habitats, incorporating sustainable production activities into the landscape, and fostering community partnerships. The GEF SGP Ecuador Country Programme supports four priority ecosystems; paramos (Neotropical high mountain biomes), dry forests, mangroves, and tropical forests). The Amazon Region, where the COMDEKS target area is located, is one of the four priority ecosystems supported by the GEF SGP Ecuador Country Programme. The Amazon region of Ecuador is characterized by a vibrant and diverse indigenous ecology. However, the region has lost nearly 20% of its natural cover within the last fifty years. The target area is a zone characterized by a richness of biodiversity, environmental services, traditional methods of resource management and ancestral knowledge of local ecology. However, in spite of these strong ties between local communities and the ecology, the region has lost nearly 20% of its natural cover within the last fifty years, triggered mostly by increasing prevalence of resource extraction industries. Further threats come from unsustainable agricultural practices and livestock, production activities that have had widespread impacts on the region’s fragile ecosystem. Conversion from intercropping to monoculture, farming on fragile soil and a decrease in crop rotation contribute to the depletion of nutrients which would naturally replenish through decomposition of the forest’s organic matter. As a result, communities are ultimately pushed to seek other sources of income through unsustainable extraction of forest resources, leading to accelerated deforestation. Finally, the gold deposits throughout the region have incentivized both legal and illegal mining activities that continue to impact and fragment the ecosystem and pollute water resources. Community members expressing thanks to COMDEKS for targeting the Napo River watershed as an area to focus activities. The target area covers approximately 484.152 hectares and is home to a population of approximately 44,250.The communities living in the region are mostly Kitchwa and are organized by cantons, which are further separated into communities and second or third level organizations. The context of the landscape is characterized by indigenous rural communities with high rates of poverty and social discrimination. Most of the rural population derives income from activities related to agriculture, livestock, forestry, and fishing. The local communities organize their production activities through the use of “chakras,” family workspaces where strategies of exchange, sale and subsistence are established. Crops for community consumption, as well as perennial income generating crops such as coffee, cocoa and bananas are grown together. Indigenous women from the target landscape in Ecuador participating in the baseline assessment. In 2013, the Sacha Causai Foundation was awarded COMDEKS funding by the SGP National Steering Committee in order to provide support for the development of the COMDEKS landscape strategy, the community consultation process, guide local communities in the development of community-based projects, and project monitoring. To engage the community and understand the current state of the landscape, a baseline assessment was conducted in September 2013 involving meetings with community leaders, trips to the pre-selected areas in the landscape and workshops for the participatory formulation of projects. A community consultation was conducted based on the COMDEKS questionnaire and indicators of resilience of socio-ecological productive landscapes (SEPLS), gathering information from men and women in the community living in the area. A Kichwa translator facilitated the consultation to ensure the community members could be fully engaged. COMDEKS projects supported in the target landscape aligns with the goal of the COMDEKS Ecuador Landscape Strategy, aimed at improving resilience of the target landscape, by strengthening initiatives that are innovative from a socio-ecological perspective. COMDEKS projects support agro ecological and agro-forestry practices to diversify household production, conserve important forest ecosystems through reforestation activities and protection of micro watersheds, and promote income generation activities such as the development of sustainable tourism and farming of native fish. COMDEKS projects are also supporting the so-called “Kichwa chacra system”, implemented by different communities in the Amazon Region to manage ancestral agriculture and diversify crops with local species by adding value to this production (i.e cocoa and wayusa). 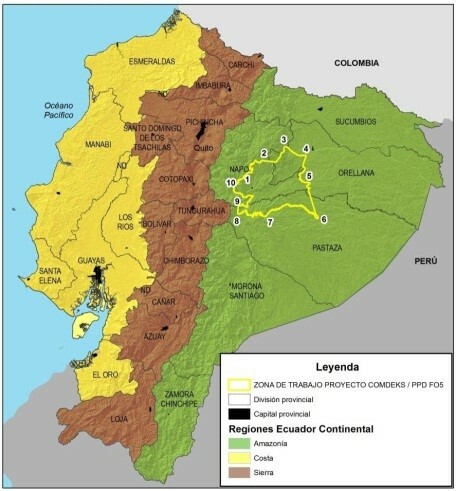 For its M&E system, following SGP Ecuador’s best practices, the COMDEKS/SGP Country Programme in Ecuador is relying on the “SIMONA” system, a territorial network of NGO and CSO partners, in strategic alliance with UNDP and the Ministry of Environment, to provide technical assistance and accompaniment to participating communities and conduct participatory M&E and capacity building.